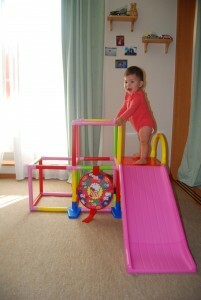 Mariya’s mini gym | Daily Life in Japan, Muravej Co.
A birthday present for Mariya arrived one day later. It is a mini indoor gym. Katya constructed it while I was working. After I came home, Mariya and I played together. She climbed up and slid down very well. This entry was posted in Katya, Liesure, Mariya and tagged birthday present, Katya, Mariya. Bookmark the permalink.